Ummmm….I blog about soup a lot. Agreed? Is that cool? 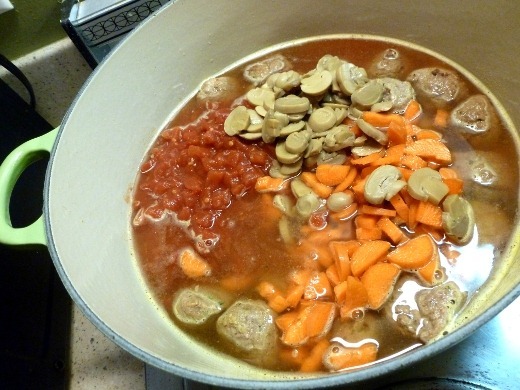 If this particular soup doesn’t appeal to you, alternatively you can click here and go read my other 46 posts about “Soups, Stews, and Chowders.” Yeah, that’s a lot of soup, in, well, almost two years. That’s right, my blog’s two year anniversary is approaching soon. That sh*t cray. Ain’t it jay? Recipe from Taste of Home/Quick Cooking. 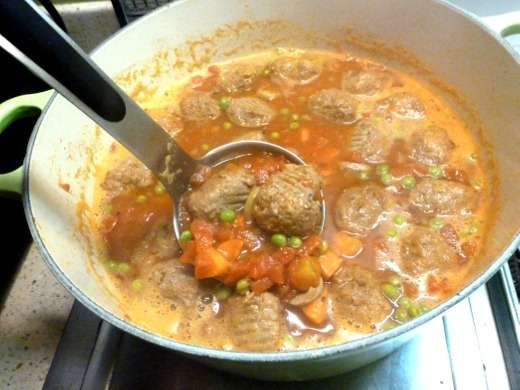 For this soup, I used store-bought pre-cooked frozen Italian Style turkey meatballs. This soup was wayyyy easy. The only real prep work I had to do was chop up two carrots. The recipe actually calls for frozen pre-sliced carrots, so if you use those, the soup will be even easier. Since I used raw carrots, I did need to add a few minutes of simmer time to allow the carrots to cook. Basically this soup is one of those dishes where you literally drop everything in a pot and go wild. Yeah, so throw all that into a pot and let it simmer for 10 minutes. Meanwhile, cook some pasta – shells or rotini are suggested – then combine the cooked pasta with the soup just prior to serving. This soup was great but just a leeeeettle. too salty for me. I did use a mixture of half sodium-free and half regular bouillon plus water in place of broth, but maybe I overdosed on the bouillon. However, all the jarred and canned ingredients are quite salty on their own (diced tomatoes, spaghetti sauce, canned beans), so that likely contributed. 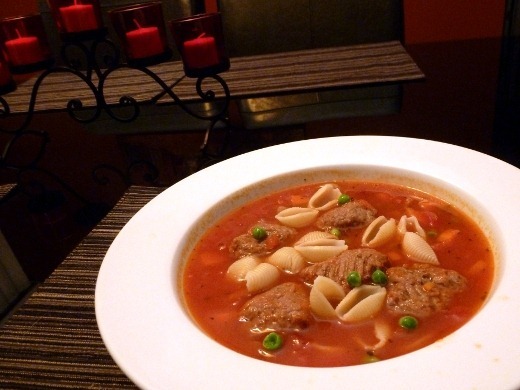 If you make this soup, I suggest using reduced-sodium or no salt-added canned ingredients wherever possible, and then seasoning to taste before serving. 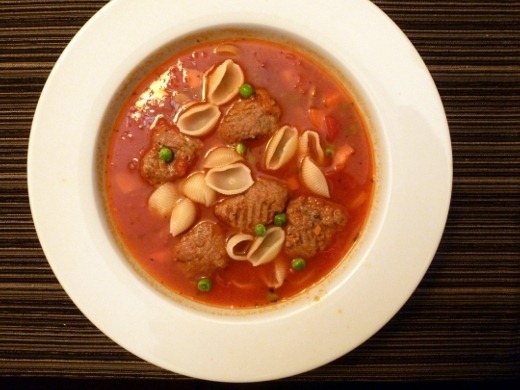 With that said, this made for a hearty one-dish meal full of lean meat, veggies, and pasta. 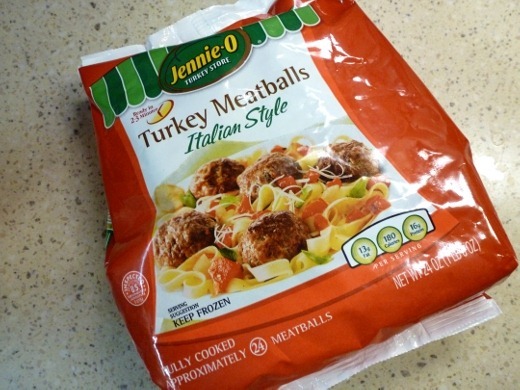 I liked the pre-cooked frozen turkey meatballs. They were giant, flavorful, and stayed together well. However, my homemade meatballs tasted better and were less expensive to make. But, the store-bought meatballs were a huge timesaver! I would use these again on a night when I want a meal on the table quickly, but probably would prefer to make my own meatballs, when time allows. Currently listening to: Satellite – Rise Against. Pingback: Ann Arbor Restaurant Week–Dinner at Sava’s « Meg.Goes.Nom.Nom.